​HSM300 Synchronous Module is special design for genset automatic parallel. On the basis of the parameters, the module automatically tests the conditions of paralleling (pressure difference, frequency difference and phase) and send parallel signal when the conditions meet parallel requirements. 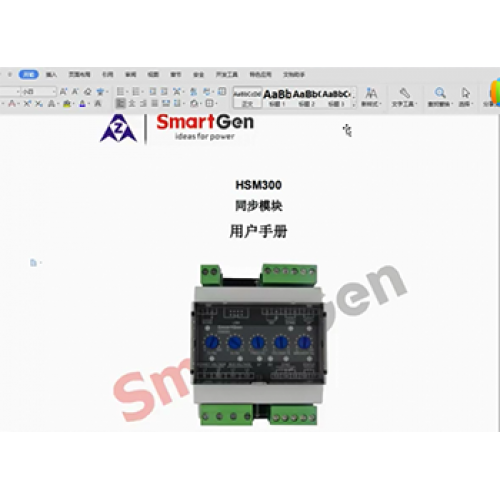 HSM300 Synchronous Module is special design for genset automatic parallel. On the basis of the parameters, the module automatically tests the conditions of paralleling (pressure difference, frequency difference and phase) and send parallel signal when the conditions meet parallel requirements. HSM300 Synchronous Module is used for the occasions that gens synchronize to bus. The module is brief to operate, easy to install and widely used for ship genset and land genset. Adjustable potentiometer allows for set main parameters of synchronizing. 1 INH “inhibit sync close output” digital input, when the input is active and gens synchronize with bus, the SYNC indicator will illuminate and sync close relay is inhibited to output.